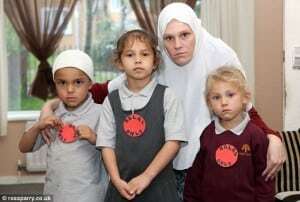 A MUSLIM family have sent their children to school with “Halal only” signs taped to their chests as a protest about the school serving their daughter non-Halal food. Talib Hussain said five-year-old Khadija Khan was given non-Halal food by staff at Woodside Academy, Bradford, on at least six occasions that the school knows of. Although he said he was willing to accept the mistake the first time, he and his family have lost confidence that the school will prevent similar mistakes from happening again. This week, Khadija, and her siblings Mohammed Talib, four, and Tayyeba Khan, three, went to the school with the message on their uniforms to highlight the issue. The school is an independently-run academy but the food is provided by Bradford Council. Meals are prepared off site and separated for different dietary requirements. Staff at the school are informed which pupils should be given the specially prepared meals. It has apologised to the family and said an investigation was under way to establish why the mistakes have occurred. Mr Hussain and wife Henna Khan, of Buttershaw, had written to the school last spring after Khadija, then four, was served non-Halal food three times for school dinner. She was also offered ham and crackers in a classroom and sent home with a bag of jelly sweets, which contains gelatin not allowed under Halal rules. The family complained, and were sent a letter by the Council to inform them that staff would be given Halal awareness training to ensure it did not happen again. But since she returned to school after the summer break the family believe she has been served the incorrect food twice more. Mr Hussain said his daughter was too young to differentiate the difference between halal and non-halal food. “Each time we complained to the school they said they were going to do something about it,” he said. “When it happens once it is an accident, when it happens twice it is a co-incidence but by the time it is happening a third time it is negligence. “There are other Muslim children attending the school and children of other faiths, how do we know they are all being served the right food? What if someone was allergic to a food and they were served it? “We were flabbergasted when it happened again. “When we went to the school with the Halal only signs on the uniforms I told the head it was a protest by me and my children. Head teacher Jane Browne told the Telegraph & Argus: “We regret this accident has happened.